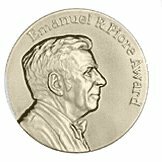 The IEEE Emanuel R. Piore Award was established by the IEEE Board of Directors in 1976. It was discontinued by the IEEE Board of Directors in 2012. Recipient selection was administered by the Technical Field Awards Council of the IEEE Awards Board.